Rock and Roll Hall of Famer and songwriting legend Cynthia Weil's extraordinary YA debut opens the secretive doors of the Brill Building-the hit factory that changed history. 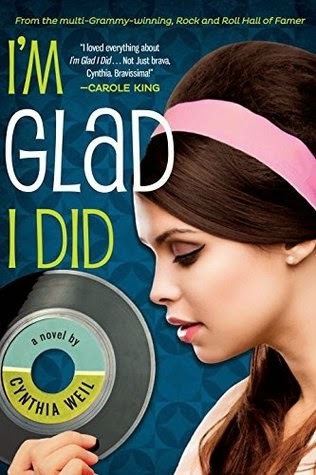 Part Mad Men, part Grace of my Heart, part murder mystery, I'm Glad I Did is a coming-of-age story at an unforgettable cultural tipping point: the summer of 1963. JJ Greene, a gifted 16-year-old songwriter, defies her lawyer parents by secretly applying for a job in the famed Brill Building-the epicenter of songwriting for a new genre called rock-n-roll. But their warnings about the evils of the music industry prove far darker than she imagined when she finds herself at the heart of a cover-up that involves hidden identity, theft, and possibly murder. Between the retro cover and the strong introduction, I really hoped I’m Glad I Did would be a success. That didn’t happen. Told in first person by JJ Green, I easily connected with the narrative and couldn’t wait for her songwriting job to start. I enjoyed everything about the set-up. Then more things were added to the plot and instead of increasing interest and making the plot run smoothly, it weighed it down. The romance. It wasn’t a focal point of the story, thank goodness, but even the romance that was there fell flat. I didn’t get the growing relationship between Luke and JJ because there was no chemistry for me. It felt forced. The mystery. There’s this whole mystery going on in the plot and while it does deal somewhat with racial and cultural issues, this also fell flat for me. Let’s be real, it bored me. There were some parts that were included that felt really unrealistic and everything that seemed to intend to move the story along only made it feel forced. The cliches. Oh, the cliches. Sometimes I enjoy reading books, usually contemporaries, that has a different story (characters, relationships, etc.) but the same story structure. I know I like it and although it’s been done before, I still enjoy it. With this, I was promised something that I hadn’t really read before—a girl in the 1960s who defies her legalistic family to be a songwriter—but was given an unoriginal plot element or cliche too many times to count. The elements that “moved” the story along felt unoriginal as a whole, which goes back to the boredom I pointed out in the second point above. Although more enjoyable in the beginning, I did easily connect with JJ and I loved having a look into her perspective of the 1960s, even if it wasn’t as much as I had hoped. The narrative was entertaining, but the story fizzled and there wasn’t anything quite substantial to latch onto. Verdict: A lukewarm book disappointing me with its potential. I hadn't heard about this book before, so when I read the blurb for the first time just now, I got excited - the time period and concept are new for me too. But the cliches sound too annoying for me to spend time on this one. It's too bad - I'm Glad I Did seems like it could have been great!